My husband is a huge oysters Rockefeller fan. It's one of those dishes (like calamari) that we always order to measure a restaurant by. 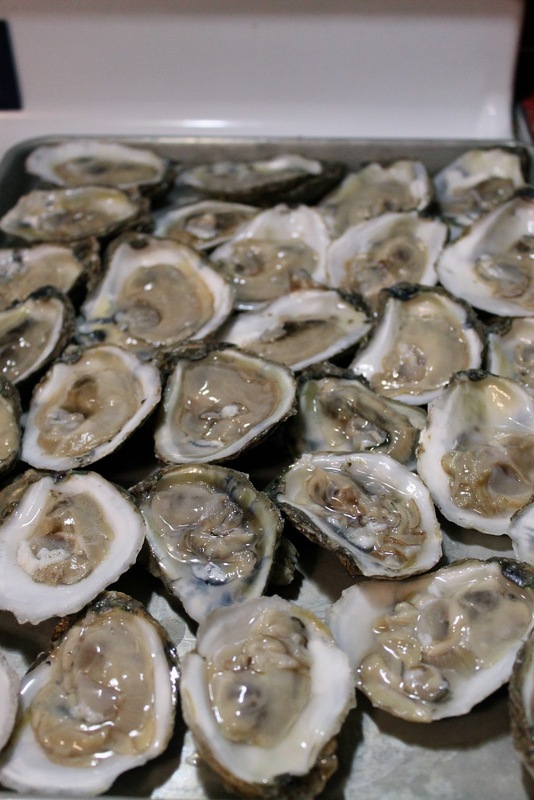 So when a friend of mine gave us 30 oysters (I have great friends, don't I?!) 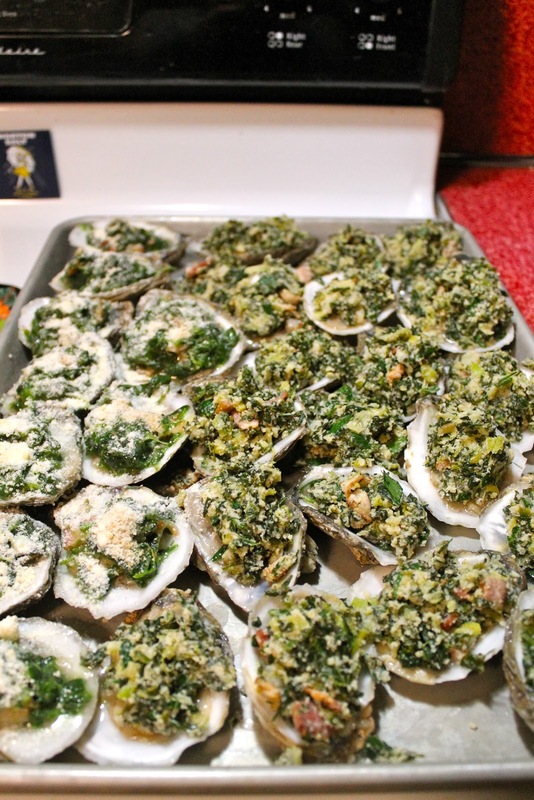 we decided making oysters Rockefeller was the perfect way to cook them up! We only had one problem: we couldn't agree on a recipe! This is not unusual. My husband and I have completely different ways of doing things. 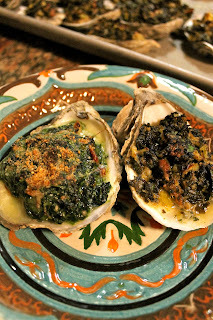 I wanted to use THIS RECIPE from Saveur Magazine, and my husband wanted to use creamed spinach and bacon. He's a simple guy, what can I say? 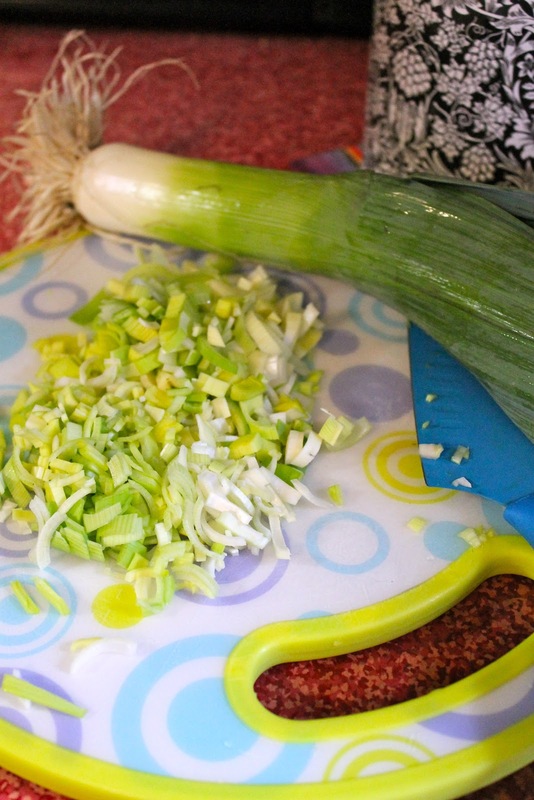 What else was there to do but to go head to head in our own version of a kitchen challenge? Of course, I cooked both versions, but I have to give my husband a ton of credit because he shucked allllll those oysters....and he stabbed himself in the process. 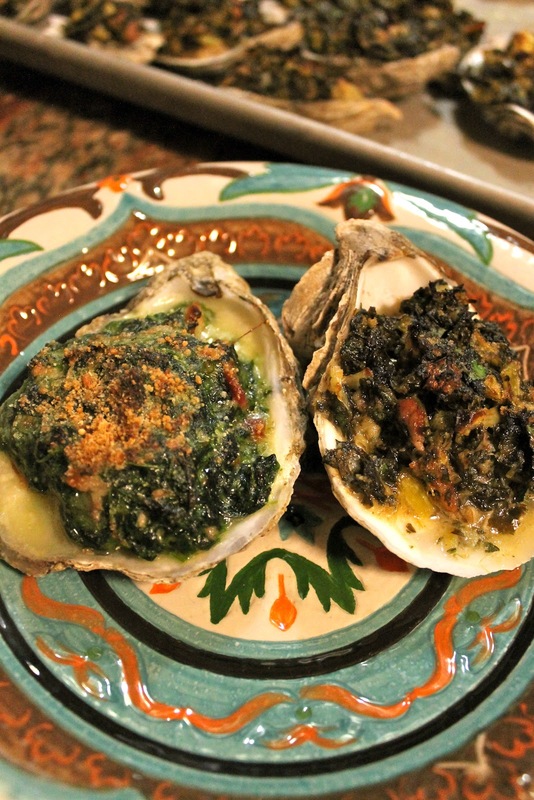 So here we go, oyster Rockefeller head to head challenge begins right now! Everything is better with bacon, right?! 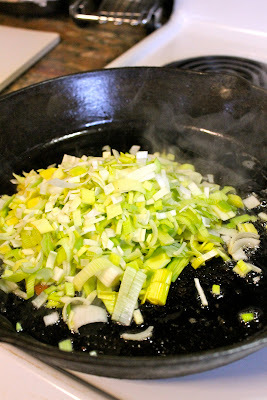 After cooking the bacon in the pan, I used the grease to cook up the leeks and garlic. 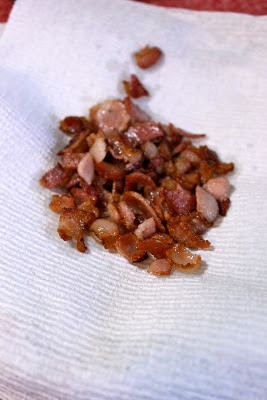 Then I added that to my spinach and parsley along with the lemon juice, bacon and a couple handfuls of breadcrumbs. Then I set it all aside and got ready to make Daren's version. I dare say, it was a bit simpler, wasn't it? I literally cooked this bacon (well, first I cut into little bitty bits and then I cooked it) and then I added the creamed spinach. Wow. That was easy. Sorry the lighting is strange, but it's the best I could do. Here is a picture of my husband shucking the oysters like a champion! I had to use every bit of willpower not to scarf these down. They looked sooooo yummy! We piled 'em high with our respective toppers. His are on the left (we put some breadcrumbs and parmesan on them) and mine are on the right. Here we go baby--in the oven on broil for 5-8 minutes! Okay, here we are--his again on the left and mine on the right. We sat, we dined....but who conquered?!?! I wish I could report that it was me. Alas, my husband's simple version won the day. I couldn't even believe it, but his were just really yummy and while mine were awesome (not to mention much more labor intensive) neither of us cared much for the parsley which was oddly a bit overpowering. Cream wins the day, as usual.